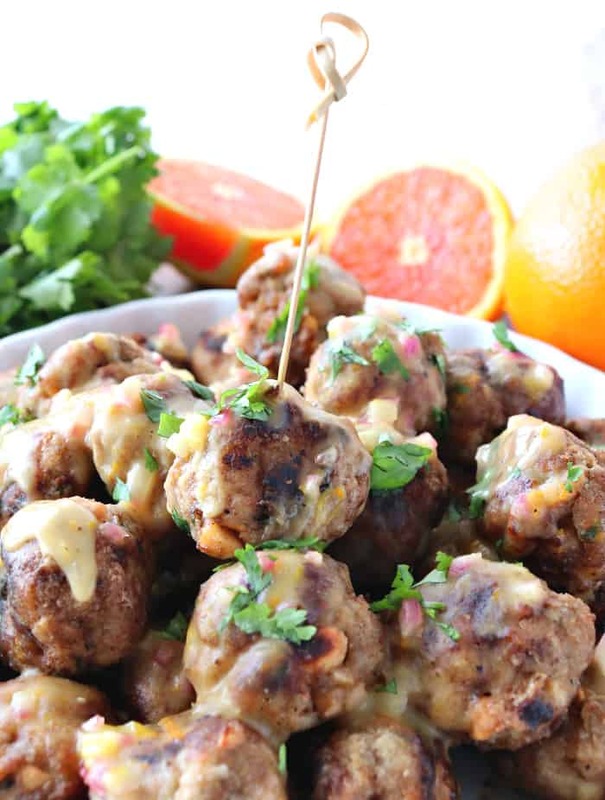 If you’ve made turkey meatballs in the past and they’ve been dry and flavorless, then I urge you to make this recipe for turkey meatballs with orange and cashews. They’re light, tender, and incredibly flavorful! 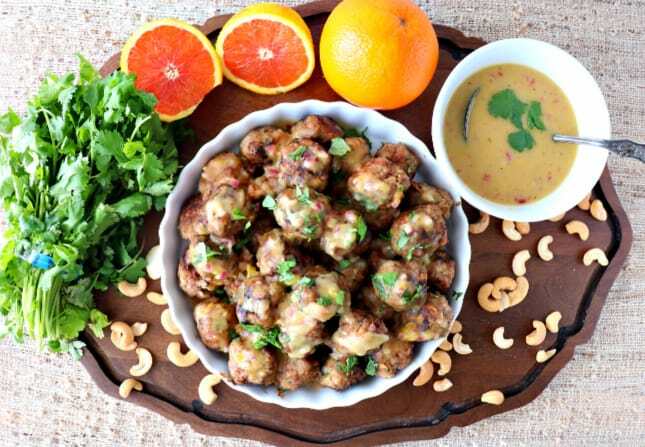 Turkey Meatballs with Orange and Cashews are fantastic when served as a main course, or when served as party appetizers! 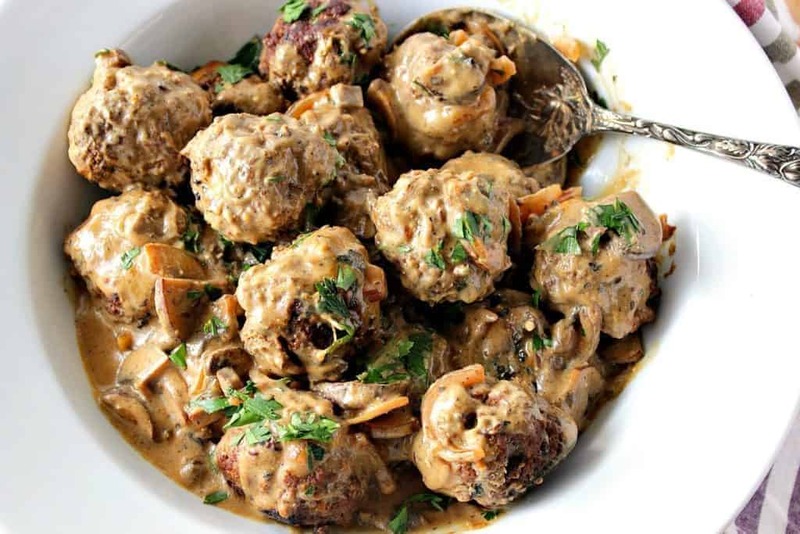 **Please Note – The printable recipe card with detailed instructions, complete ingredient measurements, and nutritional information for making turkey meatballs with orange and cashews is available near the end of this post. At first glance, you might think this is an unusual recipe list, and I wouldn’t blame you in the least. 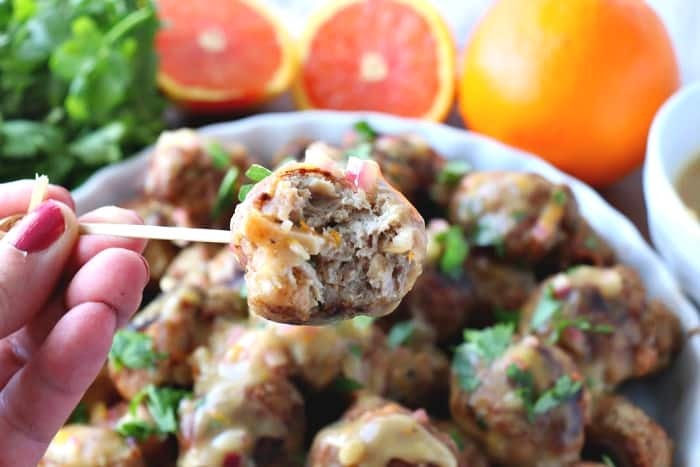 It’s certainly not your conventional meatball recipe, but that’s what I love so much about these delectably delicious turkey meatballs with orange and cashews. The oatmeal gives the meatballs their lightness in texture, and the cream cheese keeps the turkey from being dry and flavorless, as turkey sometimes can be. The fresh and vibrant taste supplied by the orange and cilantro adds the perfect accompaniment to this turkey meatball’s unique flavor. Try substituting fresh parsley or even chopped mint. I think the mint flavor would be a lovely compliment to the orange flavor in these meatballs. However, if you can give cilantro another chance and focus on its citrusy notes I think you’ll be well pleased with the addition of the cilantro in this recipe! Come on…you can do it!! **This post is being updated from the original publication in 2013. The recipe has remained completely unchanged from the original post with only the photos being updated. This article now also includes a video presentation along with a printable recipe card including nutritional information. 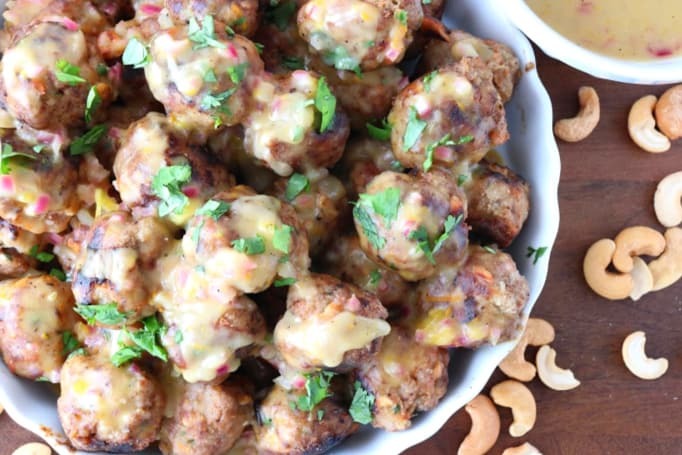 I’ve made these turkey meatballs before as a hearty main course, and also as an appetizer. When I make them as appetizers, I make them a little smaller in size than I do when making them for a family dinner. I’ve written today’s printable recipe card with the meatball size being approximately that of a golf ball, with the yield being between 20-24 meatballs. 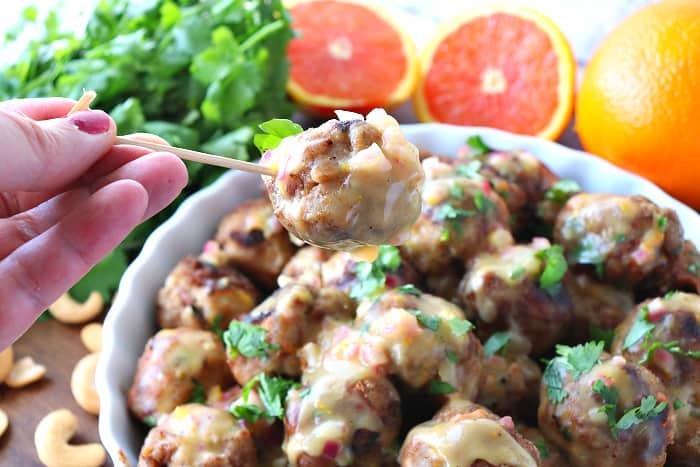 These turkey meatballs with orange and cashews are always a hit! Whenever I serve them I have people asking me for the recipe, and now it’s your opportunity to have people ask you for it too! 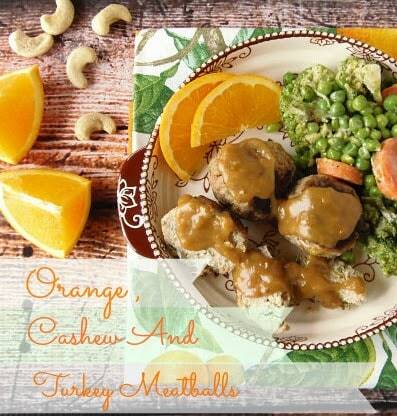 Below is the printable recipe card for today’s Turkey Meatballs with Orange and Cashews. 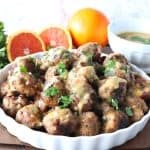 If you've made turkey meatballs in the past and they've been dry and flavorless, then I urge you to make this recipe for turkey meatballs with orange and cashews. They're light, moist, and incredibly flavorful! In a shallow dish, mix the 3 tablespoons all-purpose flour, 1/2 teaspoon salt and 1/4 teaspoon black pepper. Set aside. In a large mixing bowl, mix together the turkey, oats, 1 teaspoon salt, 1/2 teaspoon black pepper, grated onion, chopped cilantro, cashews, orange zest, and the cream cheese until well combined. Roll the turkey mixture into golf ball sized balls and roll them each into the seasoned flour. Heat a large heavy skillet over medium/high heat, working in batches, fry the meatballs in the oil until browned on all sides. Remove the browned meatballs from the skillet and place in a baking dish. Bake the meatballs in a preheated oven for 15 minutes while preparing the sauce. Reduce the heat in the skillet to medium. Melt the butter and add the flour. Stir well to make the roux. Add the finely minced onions to the roux and cook, stirring occasionally for 3-4 minutes. Spoon the sauce over the meatballs and garnish with additional chopped cilantro (if desired). Serve as a main course or appetizer. 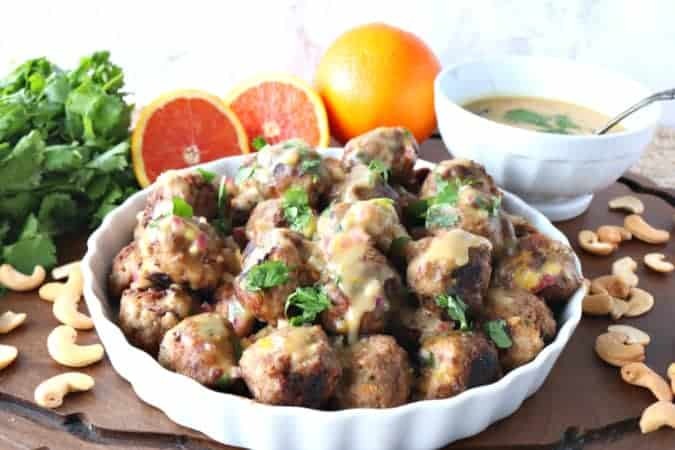 I sincerely hope you’ve enjoyed today’s recipe for Turkey Meatballs with Orange and Cashews as much as I’ve enjoyed bringing it to you! 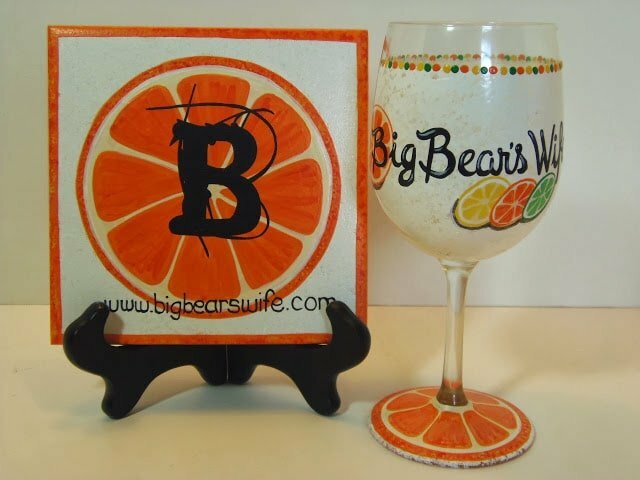 Speaking or oranges…Here’s a coordinating blog trivet tile and wine glass that I painted a while back for my friend Angie of Big Bear’s Wife of her then blog design (at that time). It just seemed like a natural choice to go along with this particular recipe, don’t you think? The ingredient list may be unusual, but I LOVE every single thing about it! 🙂 Cashews and orange are a fantastic idea! Thank you so much for sharing, going to make these for a party next weekend! Thanks, Dini! I’m sure these will be a huge hit at your party! Enjoy! These look really amazing! My family will surely love this! In the Nutrition Facts of a couple of the recipes that I have tried, the ‘per serving’ amount is stated as 1g. Could you clarify please? I’m not familiar with any of the recipe servings stating 1g. I’ve not seen this, but I have no doubt those are to be listed as 1 serving. Could you please point out which recipes they are so I can go back to see if I can fix them on my end? I’ve not noticed this as a problem so I appreciate you bringing this to my attention. Thanks for your comments. They’re much appreciated! Good to know that I just have to hone my taste for hot spices, which I usually love. Re. the serving sizes, the 1g. was listed for the Spaghetti Squash Chili, as well as your Turkey Meatballs with Orange and Cashews… but I’ll just assume the meaning is 1 serving as you mentioned. Thanks for getting back to me! I’m always happy to reply to my readers. It’s one of the perks of the job. Regarding the chili powder, please feel free to adjust any spice or seasoning in ANY recipe (not just mine) according to your tastes and preferences. If you feel they’d be too hot, or even too mild, make the recipe your own and change things however you see fit. As always, if you have any questions, I’m here to help.